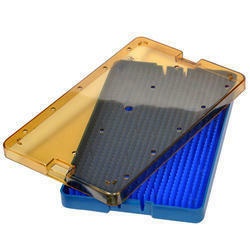 Plastic Sterilization Trays are high performance, premium quality, thermoplastic containers for proven and safe sterilization of surgical instruments & medical devices. 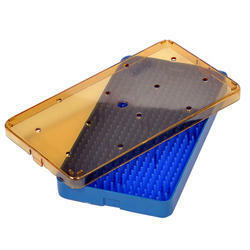 The trays are available in convenient sizes, stackable designs and are supplied with medical grade silicone mats for effective space utilization. The amber colored lid makes for easy viewing of instruments. The trays can withstand multiple cycles of high sterilization temperatures (up to 140 oc) making them ideal for use in all form of sterilization including Steam, eo, chemical and gamma sterilization. the sterixx tray sizes we currently manufacture are being used by ophthalmic, ent, dental and general surgery practitioners. 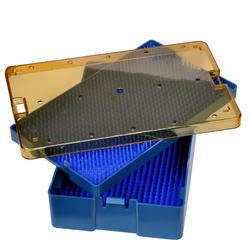 The varifit trays are used in orthopedic, cardiac and laparoscopy surgeries. We are an ISO 9001:2000 & ISO 13485:2003 certified company.